This guide shows you how to create, edit and delete folders within Sfax. Select the destination you wish to save the folder in. (This folder will always be under the Inbox on the main fax screen or under the Shared documents/My documents in the library.) Then enter the name you wish the folder to be called. Then click “Add”. The folder will be added to where you selected. To edit, move or delete folders you need to follow the steps below. Navigate to the folder you wish to edit and then highlight it. 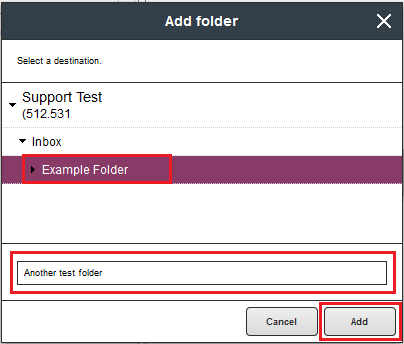 Once the folder is selected you will have the ability to select from the various options with the folder. Add, Delete, Rename, Move, or Empty the folder. 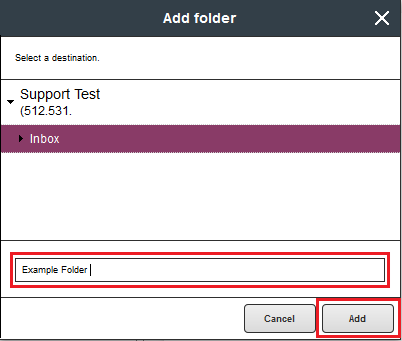 Add folder – this will allow you to create a sub-folder beneath your current folder. When you add another folder, the process will be the same as before, except you can add sub-folders to the current folder that you are working on. Delete folder – this will allow you to delete the current folder and any sub-folders to the trash folder. When you select the delete folder button it will give you a warning that you are about to delete the folder and subfolder permanently and all of the contents of these folders will be moved into the Trash folder. You will need to confirm that you do wish to delete the folder by selecting the relevant button. Rename folder – this allows you to rename the highlighted folder. You only need to change the folder name to what you want it to be called and then hit the rename button and then the folder will be renamed for you. 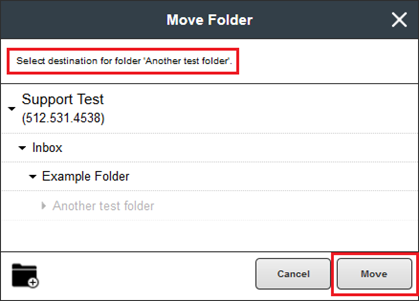 Move folder – this allows you to move the folder to another location. You will need to select the new destination that you want the folder to be saved in and then select the Move button. Empty folder – this deletes all faxes from the highlighted folder and moves them to the trash folder, but leaves the folders where they are. To empty the folder you must check the box confirming the action of emptying the folder. If this is not confirmed the folder will not be emptied. The trash folder will contain any faxes that have been deleted, the trash folder gives you the option to restore a fax if it was deleted in error. If the fax has been deleted from the trash folder the fax cannot be restored.